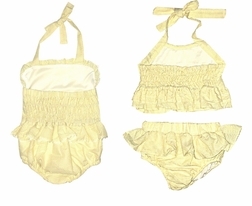 We just love seersucker and especially for making sweet little monogrammable 1 piece AND 2 piece swimsuits for little girls! 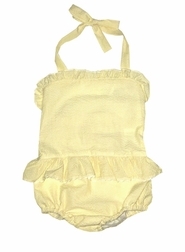 Here we offer our skirted bathing suit in yellow seersucker; absolutely stunning. Both suits tie at the neck and have elastic fitted backs. 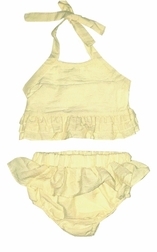 The one piece's ruffle is trimmed in white ric rac and the two piece has multiple ruffles on the top and one main ruffle on the bottoms. The suit is lined for modesty and to protect little one's diaper/pullup. The front of the swimsuit can be monogrammed with a name, 1 initial, or 3 initials.